The hobby of collecting trading cards is continuing to progress with innovative new cards making their way to the market, but also in the way fans experience collecting. While trading card shows and hobby shops are still a big part of the hobby, a new class of trade is making it easier for fans to sample products from the comfort of their own home. Collectors who want to sample a product or experience opening it at a lower price than purchasing an entire box or case on their own are now joining online breaks through Upper Deck’s Authorized Group Breakers. Group Breaks are basically an opportunity for a group of collectors to come together online and split the cost of a box or case of cards and then divide the pulled cards amongst themselves in a manner which was previously agreed upon before the break. Many collectors enjoy this new form of opening product as they still have the opportunity to pull some of the better cards in the box or case, but at a fraction of the price. Group Breaks are typically done online, and because of the growing online community of collectors, these live Group Breaks which are done in real time have become increasingly popular. The break down on how cards are divided between participants can be done several different ways. The three main ways of allocation are by team, player or by each individual insert hits. A draft is also often used to decide the order in which participants select a team, player, or insert hit. Here is how some of the most common Group Breaks work. A team breaks is when each card in a break is divided amongst participants based on the team of the card pulled. For example if an Evgeni Malkin card was pulled, the card would go to whoever had the Pittsburgh Penguins. In some instances however, the team a particular card belongs to may be unclear. Or perhaps you pull a dual card of Evgeni Malkin and Alex Ovechkin who plays for the Washington Capitals. There is a chance that card may go to the person who had the Capitals. In these situations each group will have a slightly different set of rules to assign a specific team to each card. These rules should be clearly defined prior to joining each group. Make sure you are aware of the rules regarding who will ultimately take home multi-player cards before signing up for a group break. One form of a team break is a “Select Team Group Break.” This is when a collector will select their desired team prior to purchasing a spot in a group break. This method is often problematic due to the fact some teams are more popular than others. Spots for small market teams are a harder sell, but still need to be represented before a break can happen. A way around this problem is by a “Random Team Group Break.” In this format a team is randomly assigned to participants, therefore solving the problem of disparities in team popularity. Unfortunately, this format leaves participants vulnerable to being assigned a team they may not want. The team format that solves both these issues is a “Team Draft Group Break.” In this format a draft order is selected by a randomizer and teams are then drafted by participants prior to the break. This format gives breakers the flexibility to choose how many participants they want in each break. For example a breaker could choose to have only five participants, giving each participant six teams. In these cases a snake draft would be conducted to choose teams where positions flip flop every round. Different breaks have different rules about any “extra” teams that may be left over. A “Player Draft Group Break” is when participants draft individual players instead of teams. Drafts are generally conducted in the same fashion as a “Team Draft.” For these breaks however, there is often an extra slot or two for cards that are not player specific. For example, a slot might read “Team Inserts” instead of a player’s name. A participant who selects “Team Inserts” would receive all pulls not related to a specific player. Lastly, a “Hit Draft Group Break” occurs when participants choose individual hits instead of teams or players. This breaks draft order is also decided by a randomizer and then conducted in a snake draft fashion. Like most group breaks, base cards are donated to charity and only hits are drafted. 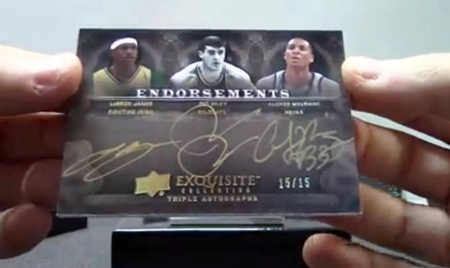 Some breaks are all about pulling the big time “hits” from the packs with little emphasis placed on common cards.